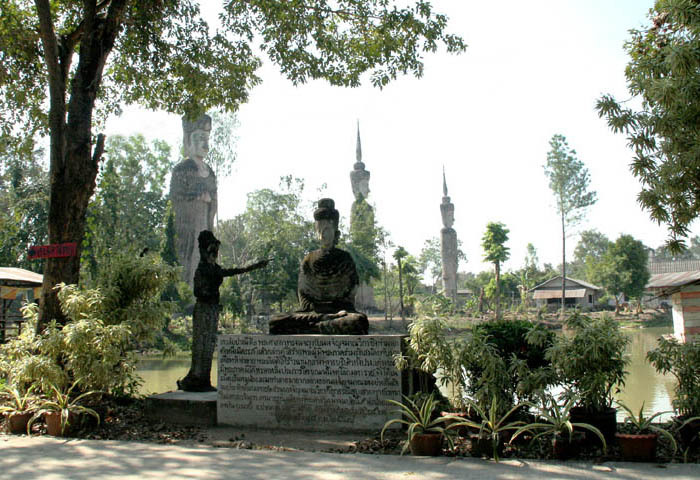 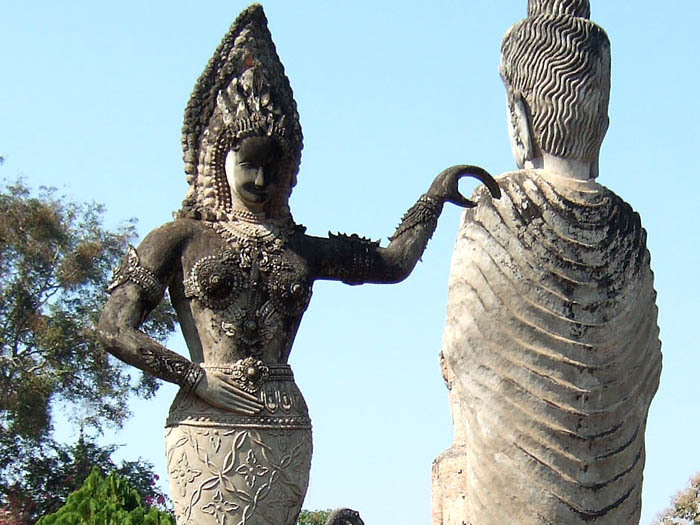 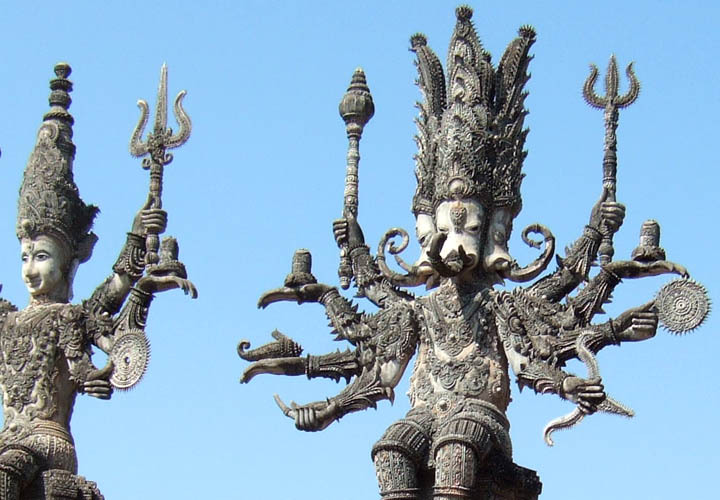 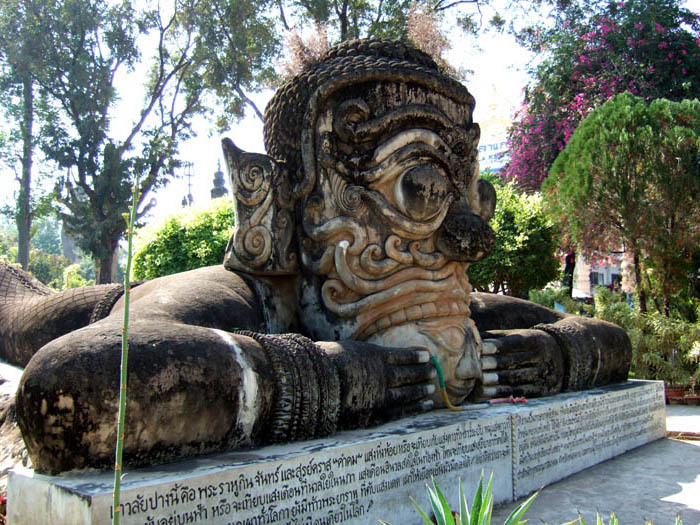 Photo Gallery of Nong Khai in Thailand. Nong Khai is about 600km from Bangkok, about one hour by bus from Udon Thani which is about one hour by air from Bangkok. 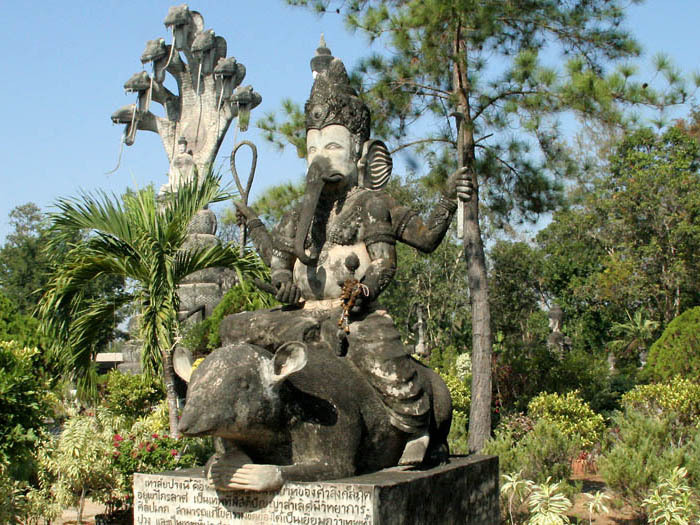 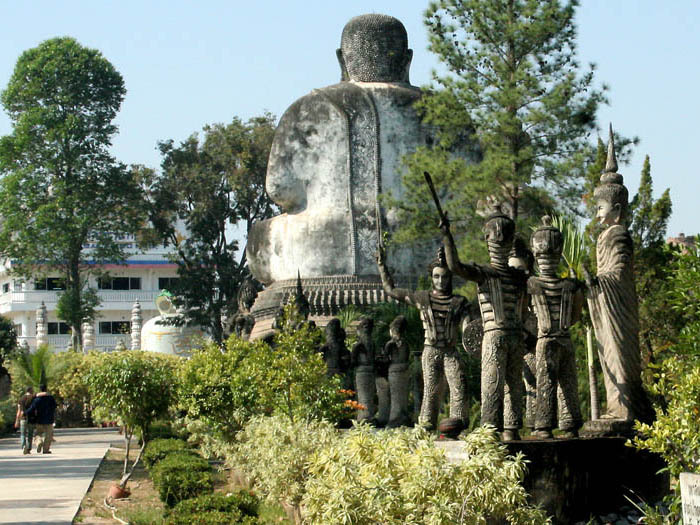 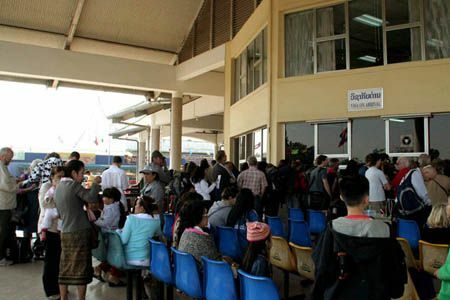 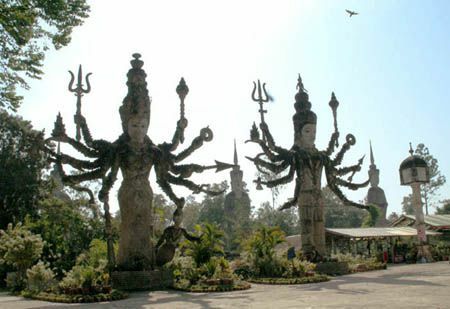 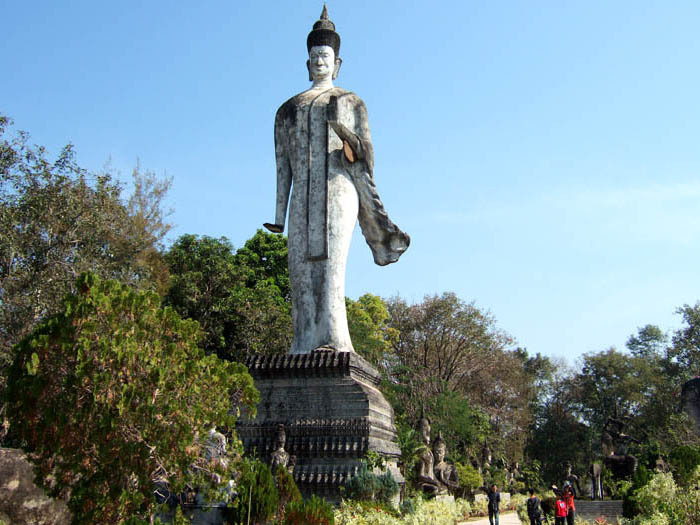 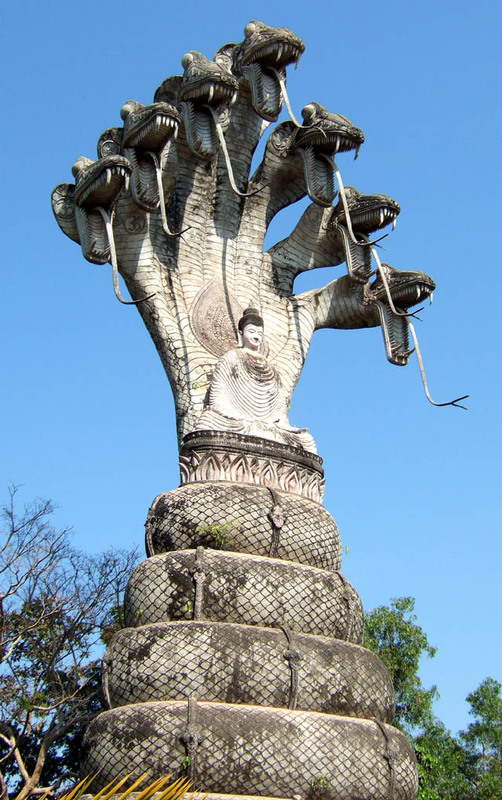 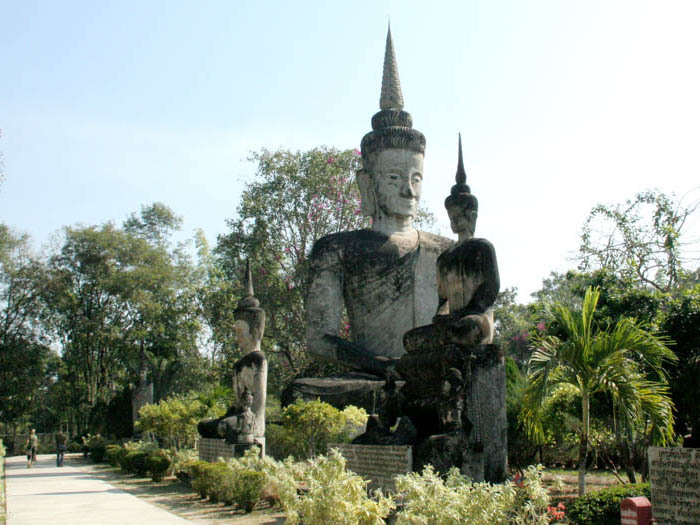 It's located around the border of Laos and Thailand across Mekong River, only 25km from Vientiane, the capital of Laos. 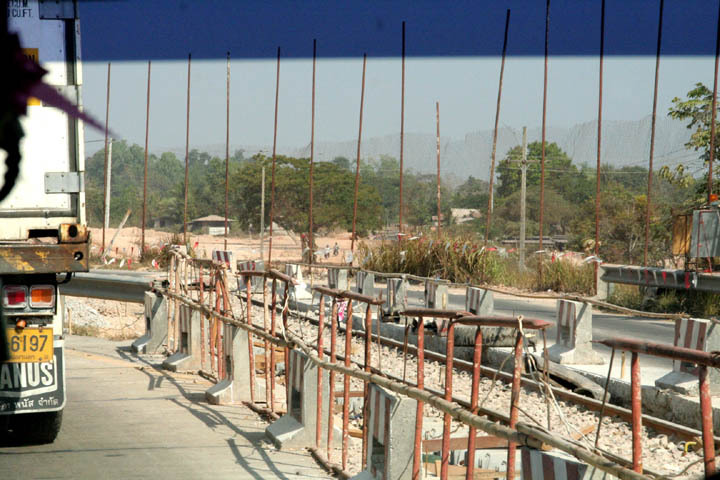 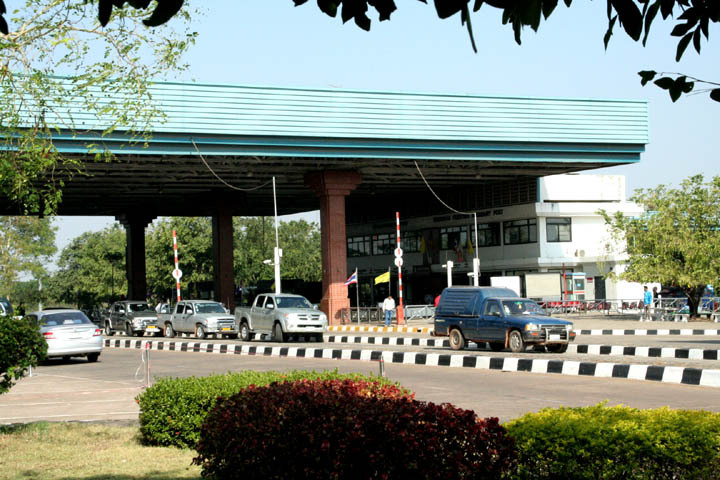 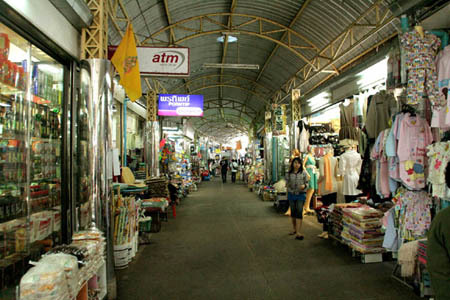 Therefore,this area has a very close relationship in commerce with Laos. 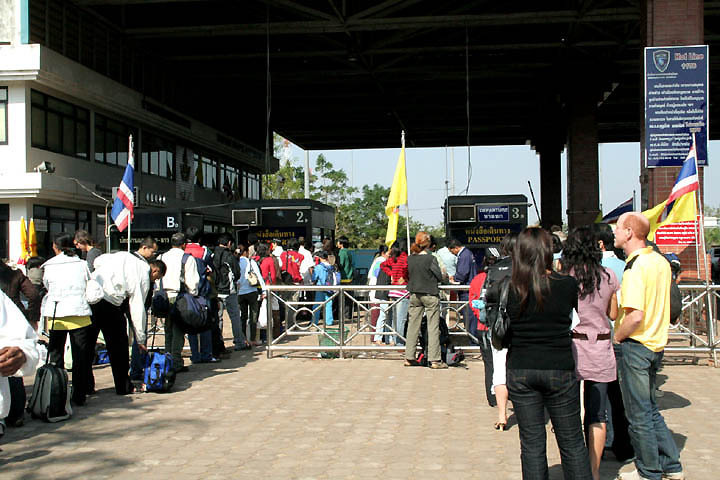 There is a famous bridge between Thailand and Laos, Thai-Lao Friendship Bridge, and a lot of people go and come everyday. 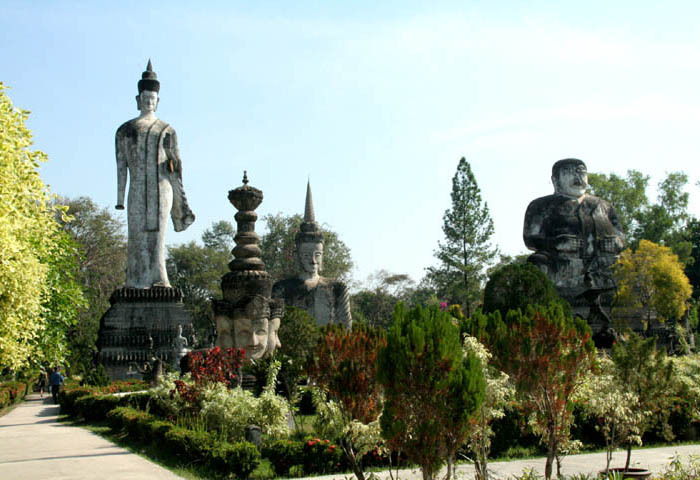 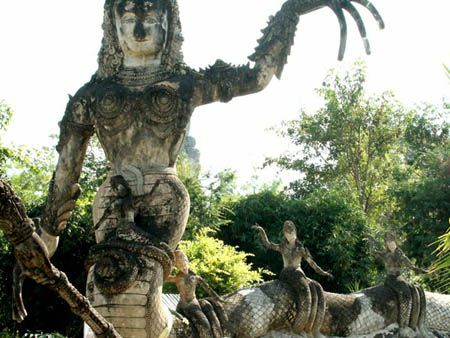 Many visitors only pass Nong Khai to visit Laos but the site shows the magnificent view of Mekong River, the mysterious temple, Wat Khaek (Sala Kaew Ku) which has various huge images of gods, and the famous and very crowded Indo-China Market (TaaSadej) with a lot of people. 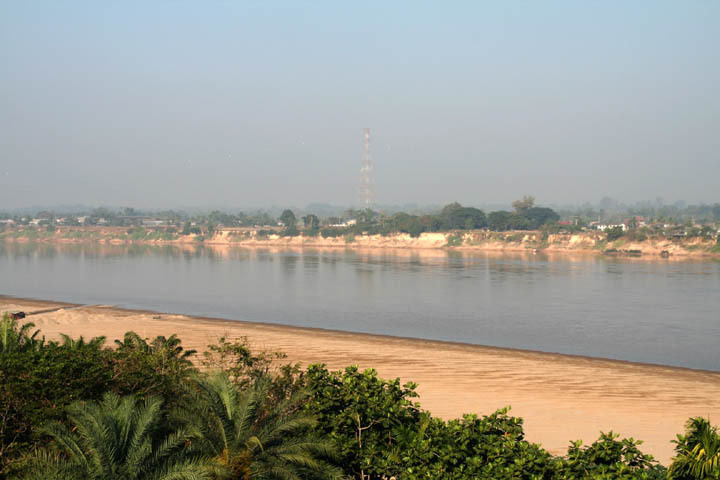 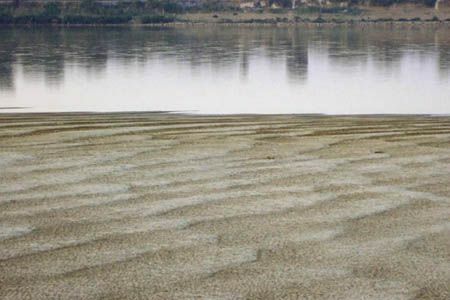 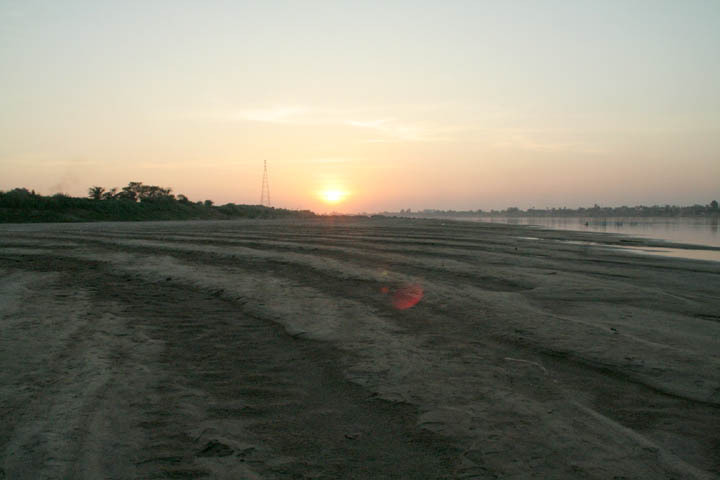 The river, Mekong, runs between Nong Khai and Laos, and the river has wide sand land like the picture. 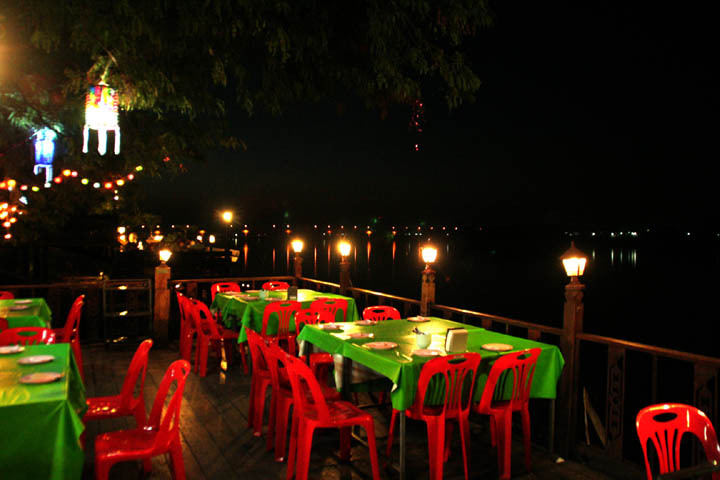 You'll see the scenery of the city, Nong Khai, and around Mekong river here. 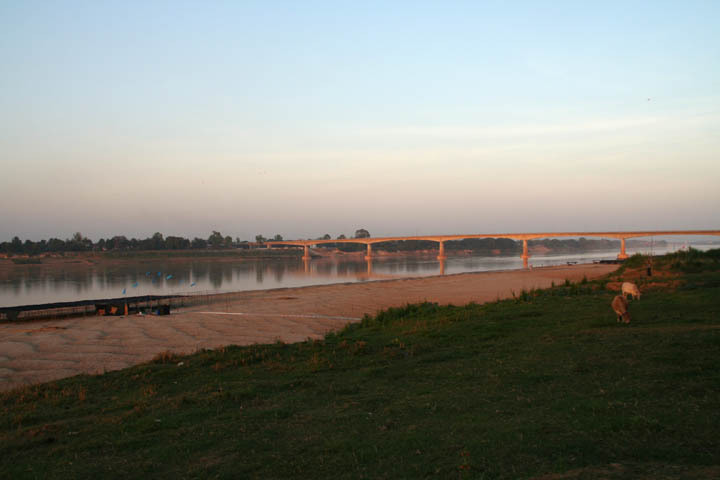 The river runs between Nong Khai and Laos, and the river has wide sand land like the picture left. I don't know if the river stream comes up to the sand area or not when the water increases but the magnificent scenery with the sunset is so wonderful. 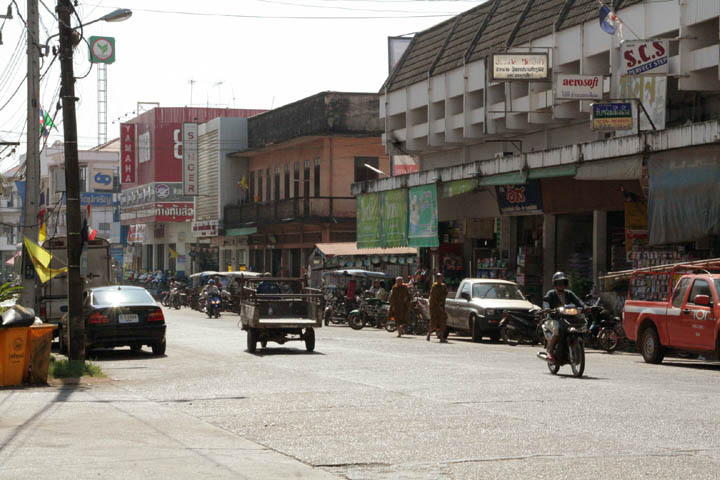 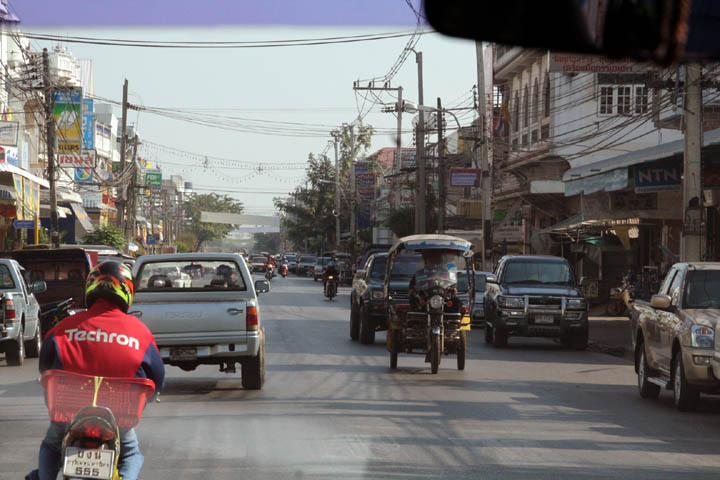 It looks like the city, Nong Khai, is not so big but the streets are busy and a lot of shops are along them. (Scenery in the day time. 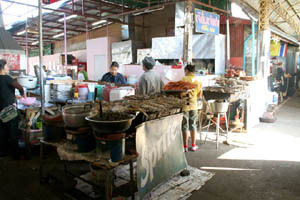 (This food is called "Kai Grata". 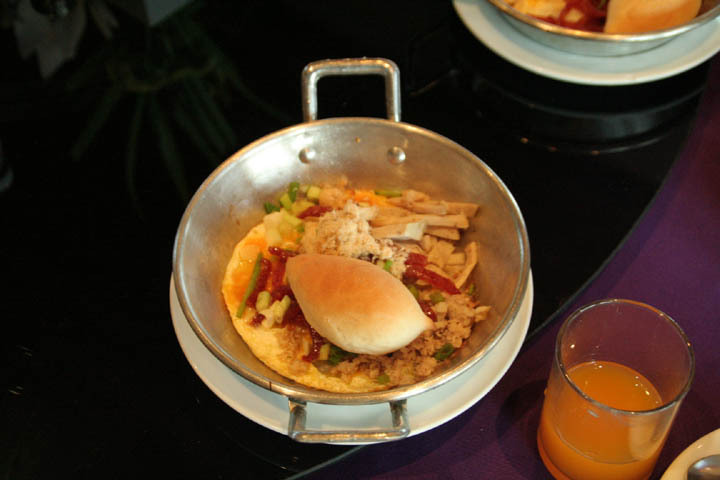 Made of bread, eggs, meat and vegetable. (The scenery of the city. 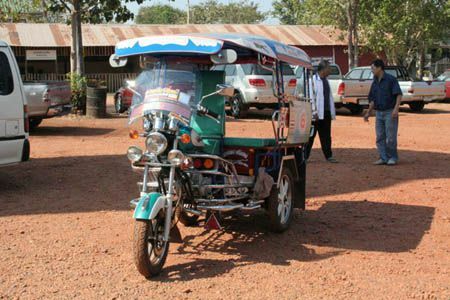 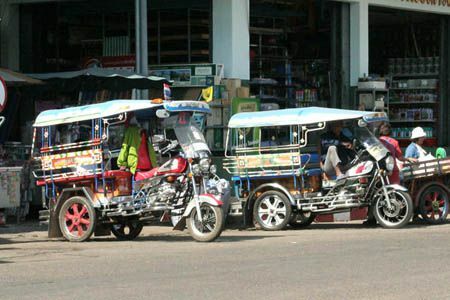 I heard that they are called not "Tuk-tuk" but "Skylab". 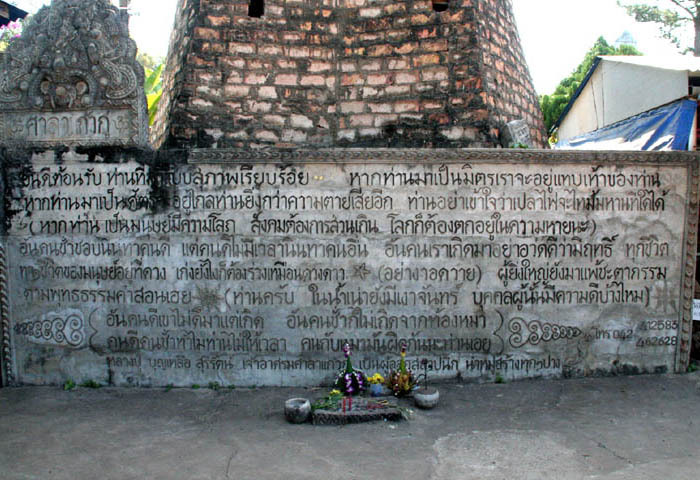 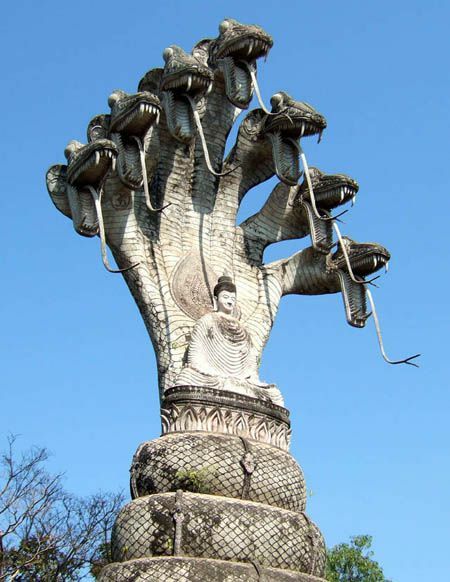 The mysterious temple in Nong Khai, the Northern East of Thailand, Wat Khaek (Sala Kaew Ku). 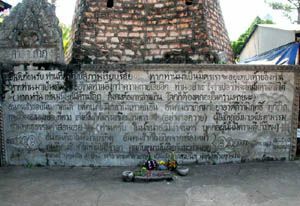 The temple "Wat Khaek" was built by a monk, Luang Puu, in 1978 who came to Thailand from Laos in 1975. 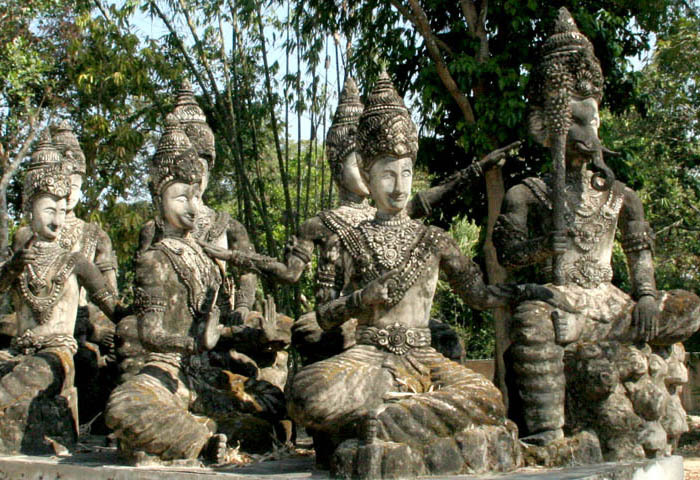 In this temple, there are giant and various fantastic figures of deities of Buddhism and Hinduism in the wide space. 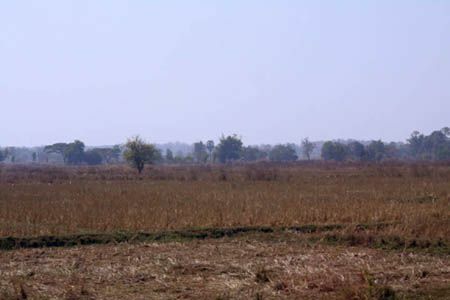 Although the pictures below can not show the real atmosphere, the images are huge, mysterious and overpowering. (The figure that stands to the sky around the entrance. 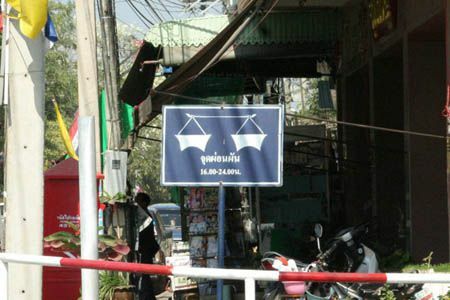 The picture right is a welcome board. 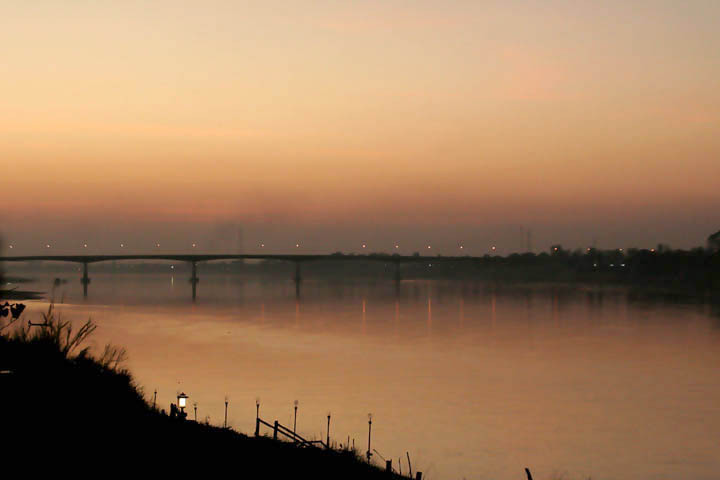 The scenery of Mekong river and the Friendship bridge with the sunset. 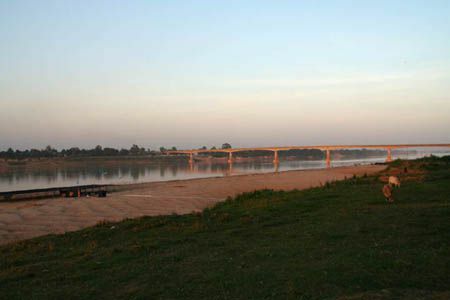 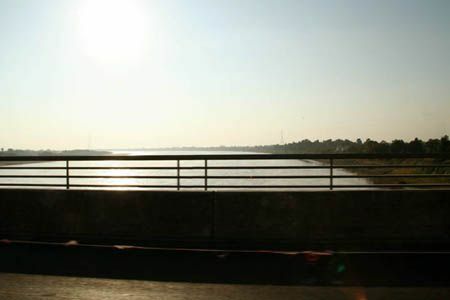 Thai-Laos Friendship Bridge was built over the Mekong river to connect Nong Khai of Thailand and Vientiane, the capital of Laos. It opened on 8th, April in 1994, and 1170 meters long. 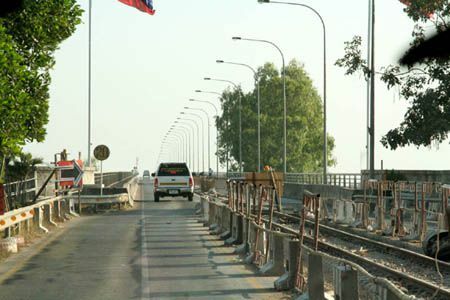 Because I saw a railroad on it, trains can go and come someday. After coming back to Japan, I got to know that the bridge is the first one and there are two more Thai-Laos Friendship Bridges. 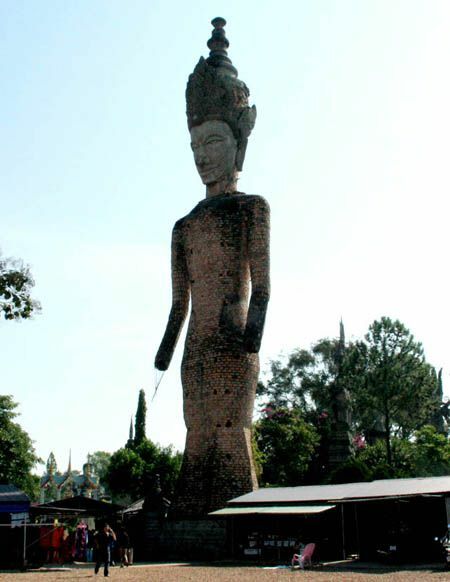 This is between Mukdahan of Thailand and Savannakhet of Laos. 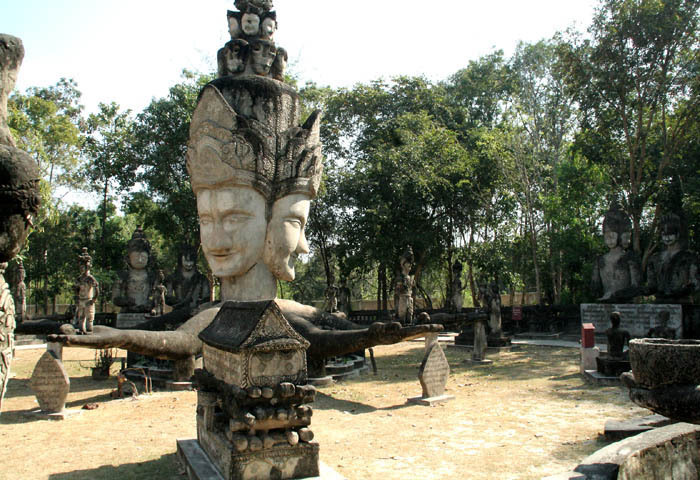 It has opened in December, 2006, and about 1600 meters long. This will connect Nakhon Phanom of Thailand and Khammoune of Laos. 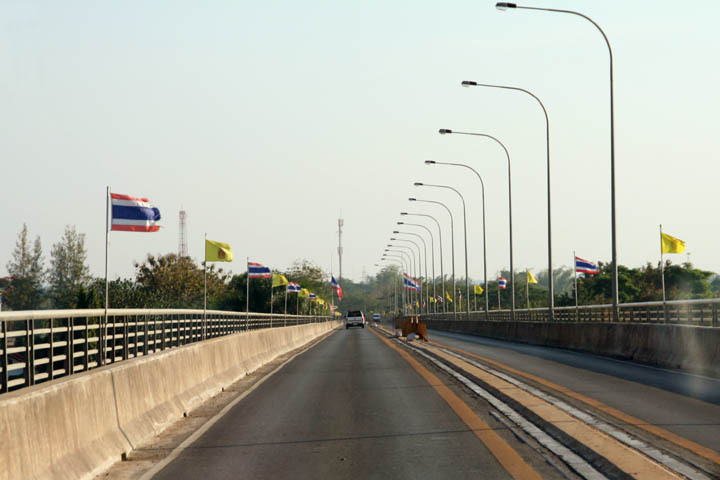 The Royal Thai Embassy in Tokyo says that the construction has been decided. Are they now building it ? 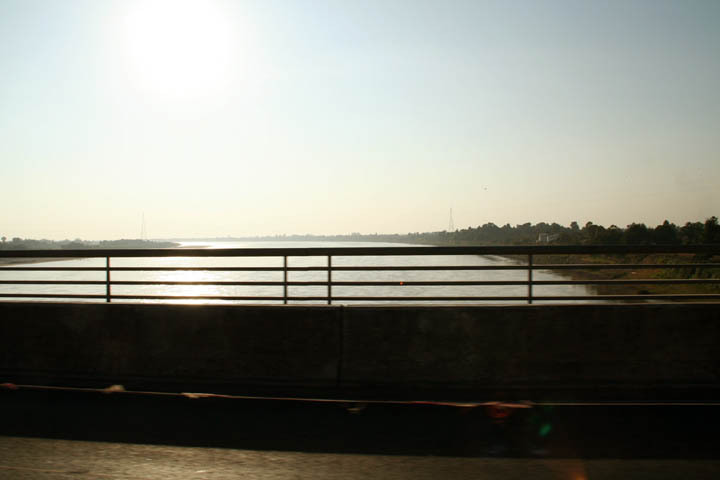 (Going over the border of the country. 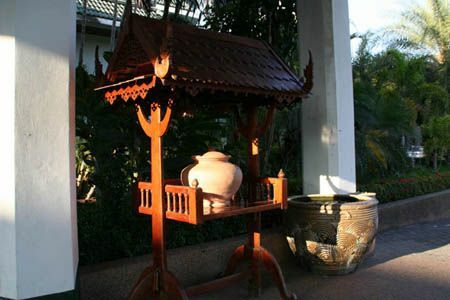 (This is coming back to Thailand from Laos. (There is a railroad on the bridge. 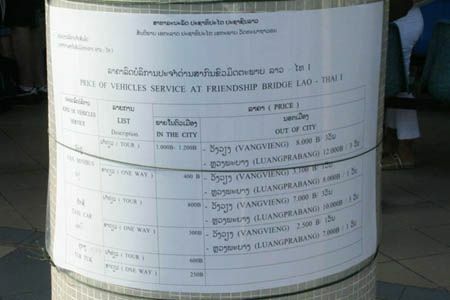 (You have to pay if you want to go across the bridge. 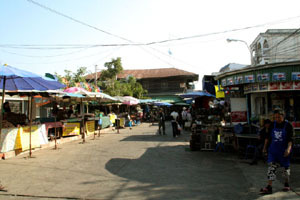 Indo-China Market in Nong Khai is along the Mekong river. 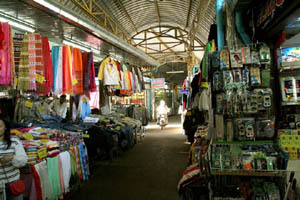 It's called "Tarad Tha Sadet" or "Indojin Market" as well. The picture left shows a lot of shops gather here along the narrow arcaded path. 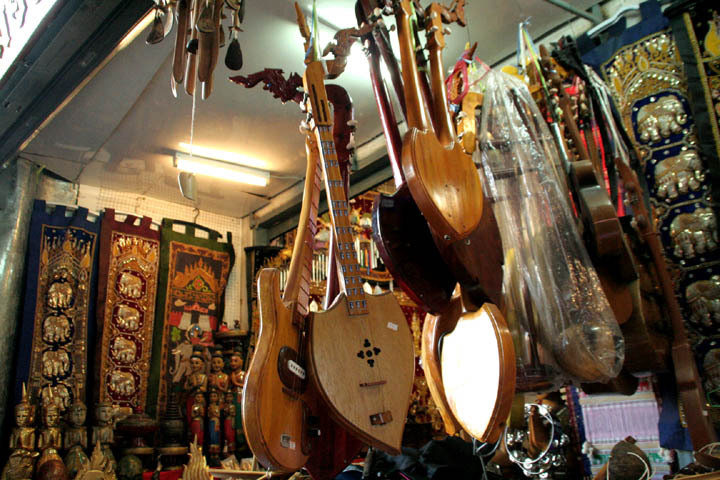 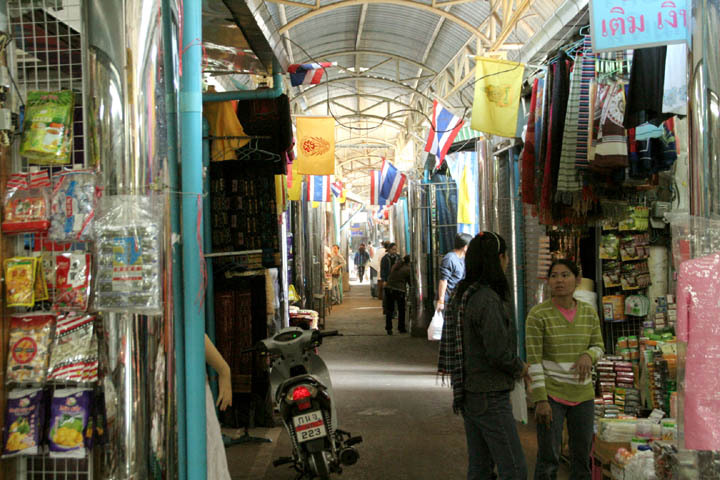 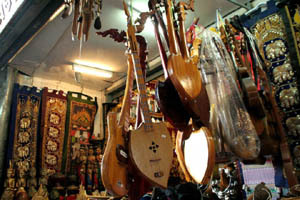 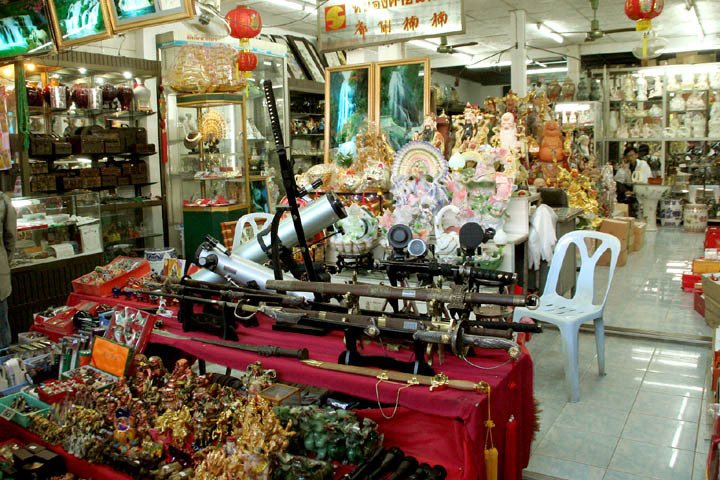 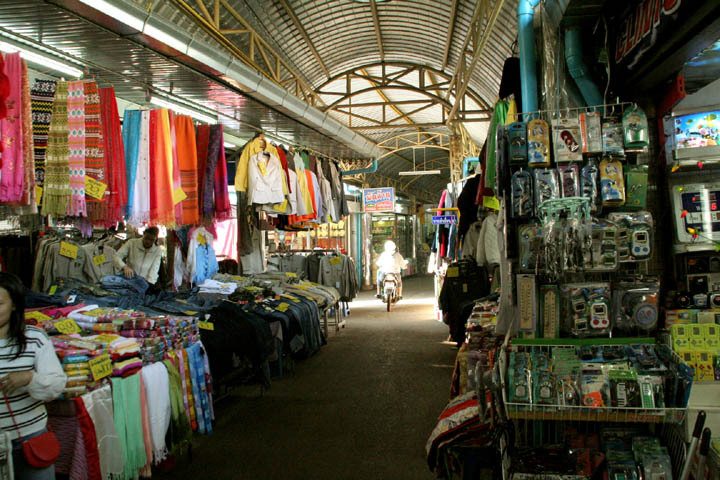 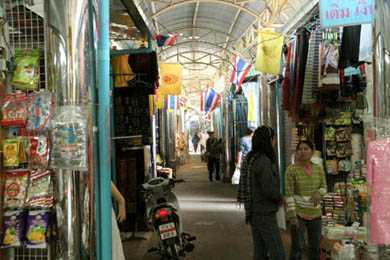 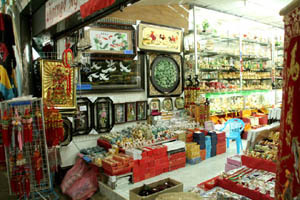 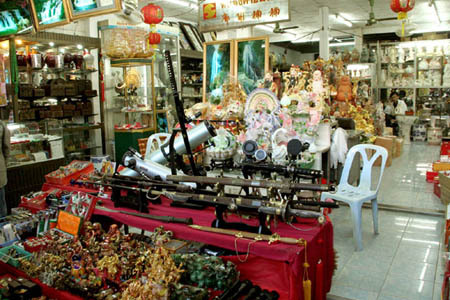 Various goods can be sold which are from next countries such as China, Laos, and Vietnam, and also from in Thailand. 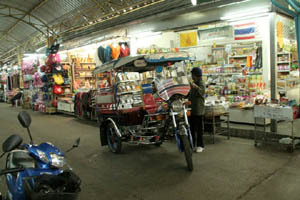 When we visited this market, it was still early morning and it was not crowded. 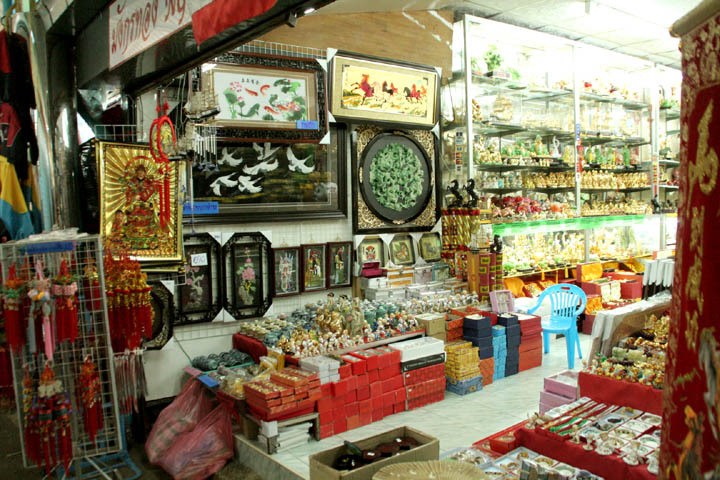 If you visit Nong Khai, visit here to find wonderful exotic gifts for your family, friends and of course, yourself. 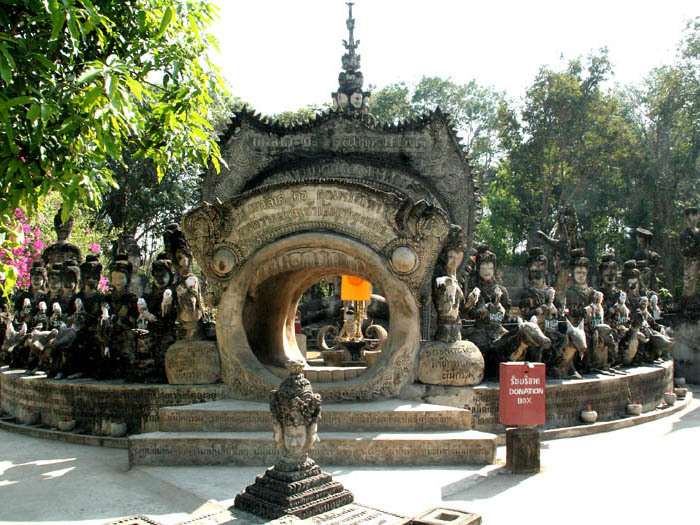 (Outside of the arcaded path.